Your clay pot crafts can make a perfect container for all your treasures. Just paint the saucer to go along with the pot and your container will have a lid! Terra cotta clay saucer (the same size as your pot). Wipe down your pot and saucer with a damp cloth and let dry completely. Paint the pot and saucer red. Paint a face on your pot after your red paint is dry. Paint the wooden spool green. Turn the saucer upside down. This will be the lid for your apple. Glue the wooden spool on to the bottom of the saucer. When the paint is dry, spray it with the clear acrylic sealer. Cut a small leaf shape out of felt and glue it to the wooden spool. Your apple is now done! 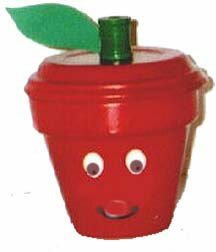 This is one of the easy arts and crafts idea and can also be turned into any vegetable or fruit. It looks real cute as an orange. There are many clay pot craft ideas and I have listed a few here. Please check them out. I will be adding more all the time so check back ofter.